This dog is said to be legendary in the toughest of water and weather conditions. A very intense hunter of upland birds and is the quintessential cold-water duck and goose-retrieving specialist. The Chessie becomes firmly attached to his owner and family. Long time Chessie owners have said that starting at puppyhood, a fair but firmer hand is needed in training and discipline to earn the respect of this noble dog. Trainers of Chessies say that an owner should expect them to challenge their authority. There are large variations in color, such as tan, light red, deep reddish chestnut, a light straw color termed “deadgrass,” brown, etc. This dog needs plenty of exercises to prevent misbehavior. They are not aggressive but will not be bullied. Females: 55-70 lbs; males 66-84 lbs. 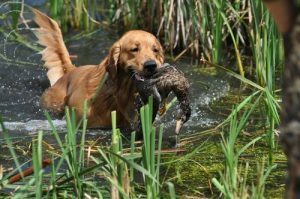 An excellent retriever of game from the water and a popular retriever in Australia and New Zealand, this dog excels at hunting in marshy terrain. The Curly-Coat seems to enjoy inclement weather in which to hunt and is therefore not a good house dog. They are action dogs that live to swim and are not deterred by ice, snow or dark and threatening skies. In fact, some have said this animal enjoys these conditions. A Curly-Coat is devoted to its family but aloof to strangers. Highly intelligent, so it must be challenged early and thoroughly or else its intelligence will be used to further its own goals. The breed has a will of its own but is highly sensitive; therefore obedience training should be consistent, not rough. They weigh 62-77 pounds, and are black or liver in color. The coat consists of very tight curls that are water and dirt resistant. This dog was known as the favorite of the British gamekeeper since they excelled at the basic hunting tasks of flushing game, working any sort of cover, locating cripples, and retrieving from land and water. The Flat-Coat is known to have an excellent nose. They stand approximately 24 inches tall and weigh approximately 60-70 pounds. The traditional color is black, however, liver is also seen. Their personalities are enthusiastic, responsive and versatile and they are noted to be a devoted companion. Intelligent and quick to learn, however, the Flat-Coat cannot be drilled repetitively on the same routine. They do not respond well to mechanical training methods. 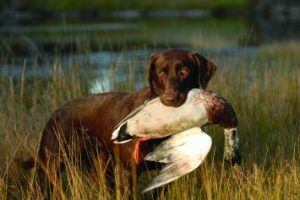 Almost as easy to train as the Labrador retriever, this breed is a wonderful hunter of upland birds such as grouse, pheasant, and woodcock. 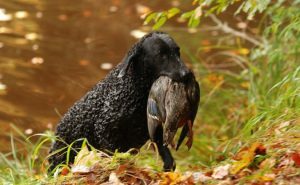 This dog is dually adept at hunting waterfowl. 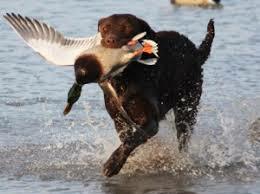 It is a good choice for the hunter who wants a versatile dog adept at upland hunting and waterfowl retrieving. It has been said that the golden is not as rugged of a retriever as the Labrador or Chesapeake. Very trainable and has a somewhat softer nature than the Labrador. An extremely friendly and affectionate dog, they average over 65 pounds, 20-24 inches in height at the shoulders, and has a long wavy coat. Color ranges from light blonde to dark red, with the darker colors being more prevalent in field lines. Avid hunters need to ensure that the pedigree of their puppy comes from strong field lines as the bench/show lines may not be as strong in the field as a hunter may desire. This dog loves all people and is therefore not a good watchdog. This spaniel was developed in Ireland as a retriever. 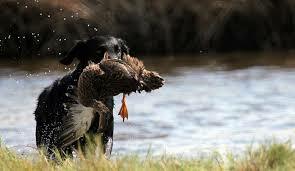 They are allowed to compete in field trials due to their size and ability to fetch ducks, geese and upland game. 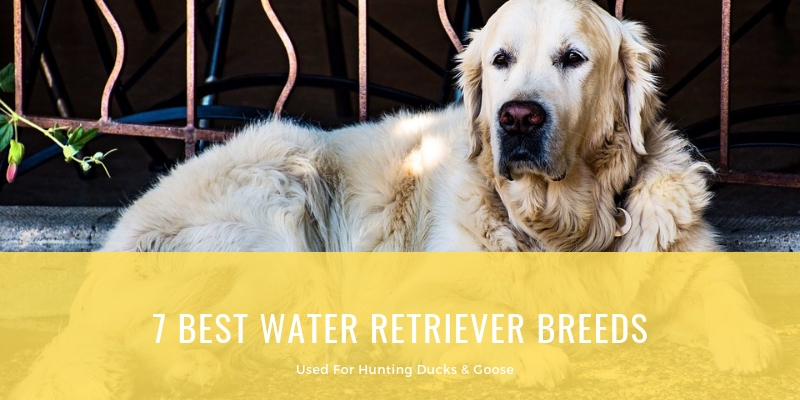 They have a curly liver-colored coat that water drains off like a poodle due to its tight curls, with a wooly underlayer that provides warmth to the dog allowing it to stay in the cold water for long periods of time. The hair is short on the face and the end of the tail. The coat requires removal of burs when doing upland work. This dog is obedient if given early and consistent training. This breed should have a knowledgeable dog person as an owner to assert authority over it and develop its clownish personality. A good foundation as a puppy will lead to a dog that shows intense devotion to the family and will curb its natural distrust of people. 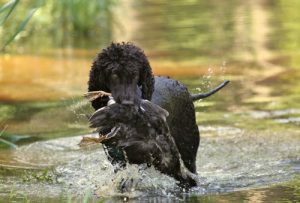 The Irish Water Spaniel may be slow to mature leading to slower training. However, once a task is learned, they require little brushing up on the skill. Its natural ability for pranks can either provide frustration or laughter for its trainer. The dog is a medium size for a retriever breed, standing about 20-23 inches tall and weighing about 65-75 pounds. This dog has been the most popular dog in America for greater than the last decade. They are popular since this dog learns quickly and is easily trained. It can fetch from land or water and can be taught to work before the gun, flushing and retrieving game. There is also a society for pointing Labrador enthusiasts. Typically the Labrador Retriever has a calm and cooperative nature that makes it a fine companion. This dog is solidly built with a water-repellent coat, short ears, and a thick otter-like tail. The Lab typically weighs 55-75 pounds standing 20-24 inches at the shoulder. Colors are black, yellow (ranging from “white” to fox-red) and chocolate. Avid hunters need to ensure that the pedigree of their puppy comes from strong field lines as the bench/show lines may not be as strong in the field as a hunter may desire. Also, strong field trial lines may produce a pup that is too intense or high-strung, making the dog more than the average hunter wants to train or handle. This dog may not make a good watchdog, as typically there is no distrust in a Labrador’s generous heart. The toller became the 150th recognized breed of the American Kennel Club on July 1, 2003. This dog is said to have originated during the early 19th century. It is known for its unique ability to toll or lure and retrieve waterfowl. It’s playful antics draw the waterfowl into the range of the hunter by piquing the ducks’ curiosity. It is found, however, that most individuals’ use the dog to retrieve instead of actually tolling. 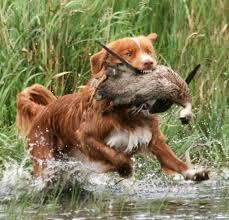 The toller is noted to be good in cold water and will retrieve repetitively without boredom. The toller typically has a burnished medium length red coat, often with a white-tipped tail. They are the smallest of the North American retriever breeds, weighing approximately 40-50 pounds. They are seemingly docile dogs, extremely intelligent and devoted to their owners. The toller is suspicious of strangers and makes an excellent watchdog. The secret to training a toller is to establish and maintain a rapport with the dog. Harsh training methods without praise will only bring out the stubbornness of this dog.